The Birmans personality is unique. At first sight they appear to be very majestic - which they sometimes really are - but they are also very friendly, intelligent, even-tempered and they love their "humans / family" to whom they are always loyal. This cat follows your around in the household just to be near you. Because the Birman ist interested in everything you do. It always wants to be there where the action is. Birmans are very faithful creatures, devoted to their owner and bond to all family members - especially kids. As long as the kids are not overly boisterous you will allways find these cats near kids. Mostly you will have to protect the cat from the kids enthusiasm. Therefore it is important that kids are taught how to handle cats with respect. They even welcome your visitors. At first they step up to them with caution but in a smooth and freindly way. After the cat has "checked" your visitor it will almost treat him/her as a family member. Of course to satisfy its curiosity! 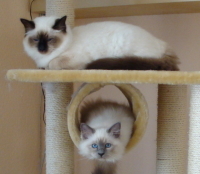 Birmans love life and their life revolves around their humans/family and everthing they do. Thus, if you are working it's always better to adopt two instead of one vat. Two cats do not result in more work than one. I cant tell you from my own experience. Even if you are at home all day it will be nice for the Birman or any other cat to have someone around who speaks "the same language".